This instrument, originally from Fremersdorf/Saar, was erected in Trier in 2001, where it was given a space adjacent to the altar area and has since replaced an irreparable work on the gallery. It was created by Organ Manufacture Haerpfer-Erman of Boulay, near the present border, halfway between Saarlouis and Metz, in 1959. Many of their organs remained intact in the Saarland, which was French economic territory in the 1950s. Language troubles with the Saarlander did not occur, since Boulay (or Bolchen in German), while located in Lothringen, is still on the German side of the language border. 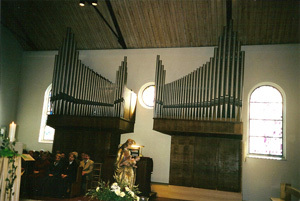 Furthermore, the French government made the choice of organ builders easy by imposing significant customs duties on imports for instruments from Germany. The organ of Christkönig; a French organ in Trier and a little bit of economic history.